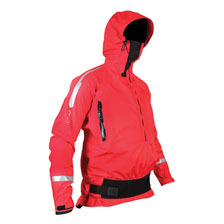 A paddle jacket made for expedition sea-kayaking, made of 4-layer material AirFour. Breathable and with great watertight qualities. It’s designed to allow free range of motion. The jacket has an inner neoprene neck that closes by pulling the zipper all the way up. The hood fits comfortably around your face and is fitted with 3D adjustment system (horizontal, vertical and around the face).The chin area of the hood is made of soft neoprene material and has vents for breathing. Long front zipper with taping is slightly off-centre to avoid rubbing on sensitive chin area and allows closure all the way to your nose. Double wrist cuffs are made of extremely flexible neoprene with Velcro outer cuffs. Double waist maximizes water tightness of the jacket. CONQUEST has two pockets in front, a larger one accessible from the outside with a taped zipper and a smaller one on the inside.